Once synonymous with suffering and death, Spinalonga, the jewel of Mirabello Bay, has risen to world fame through Victoria Hislop’s international best-selling novel, The Island – and the subsequent TV series, now regarded as the best fiction program in Greek television history. Building up to this cultural momentum, a movement was started with the intent of making the Elounda island famous around the world, claiming its place among the list of UNESCO World Heritage Sites. The nomination was submitted last autumn, and it is now entering the final stage, which offers a great opportunity for the series cast and crew to revisit the island and express their support. The Greek Ministry of Culture offered a budget of €6,000,000 for the monument’s maintenance. However last year the ticket price to enter was raised from €2 to €8 “due to an influx of tourists”, the mayor points out. From his part, the series’ director Thodoris Papadoulakis shares his vivid memory of “the Exodus scene, with Victoria Hislop embracing the late Manolis Foundoulakis, who was in fact, the last resident of Spinalonga suffering from the Hansen Disease. He sadly passed away before the TV series premiere four years ago. On that last shooting, Manolis finally felt free from his curse”. However, before his demise, Manolis Foundoulakis had the chance to watch the first scenes of the series before the final cut. They were specially presented to him and he was very moved. The Island was dedicated to his memory. For Margarita Panousopoulou, who played the part of Kalliopi, the series was an opportunity for her to walk through Cretan customs and culture. In fact, for her role she was taught how to weave using the traditional Cretan loom. But it was the emotional lesson that still lingers on, as she realised, through her participation in the series, how “leprosy is still considered a curse, even nowadays”. It was through her interaction with the late Manolis Foundoulakis that she understood what it means to be cursed and exiled in Spinalonga. She admired the Cretan people “for strongly supporting their beliefs and customs till the end. Crete remains always a symbol of fertility” for her. 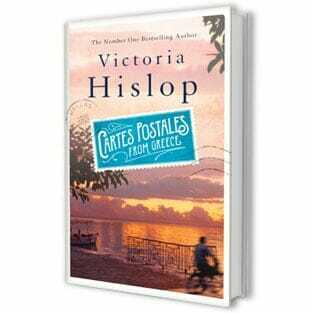 Playing an outlaw who desperately tried to keep her healthy baby from forced adoption at the hands of the authorities – which was the norm during these dark times – Margarita herself remembers how she was encouraged by Victoria Hislop to ‘escape’ from the emotional toll that the shooting had on her, fondly remembering joining the author in hijinks with raki and the enthusiastic local joining them with signature Cretan kefi!